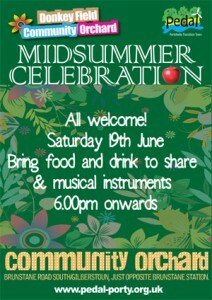 Saturday 19 June from 6 pm. Everyone is wel­come to come to the party; please just bring yourselves, food to share and some­thing to drink, wash­able cup, plate etc, plus a music­al instru­ment if you play. Feel free to bring a bar­be­cue if you like but not dis­pos­able ones please. Brunstane Road South/Gilberstoun, just oppos­ite Brunstane Station. This entry was posted in events, Orchards. Bookmark the permalink.